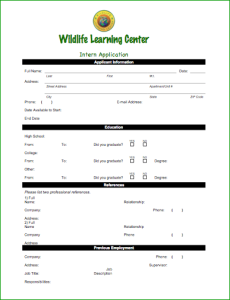 Interested in becoming an intern at the Wildlife Learning Center? 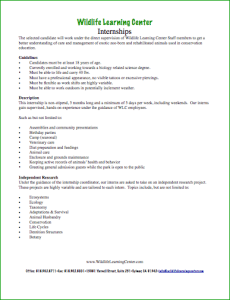 An internship with Wildlife Learning Center (WLC) is an exciting opportunity for anyone who is interested in gaining zoo husbandry experience. WLC interns work closely with staff biologists to care for over 100 rescued and zoo-born wild animals and to providing public education in the life sciences. The position is physically demanding, fast paced, and requires moderate lifting, bending, and extended time on your feet. Interns work extensively outdoors regardless of weather conditions. Interns must be flexible with their hours as schedules can be highly variable. Interns are expected to maintain a professional and friendly demeanor at all times. Interns will shadow and work closely with WLC staff biologists, volunteers, and other interns. Interns will help to clean enclosures and equipment, prepare diets, provide behavioral enrichment, and interact with the general public to give wildlife education. Additionally, each intern is required to complete a project during his/her internship. The project may involve public education, behavioral enrichment, or another approved project that contributes to the goals of WLC. Must be at least a freshman in college, majoring in biology or a related animal science degree. In good physical health and capable of lifting 50 lbs. Qualified candidates will undergo an interview. You may qualify for a Skype interview if you are not able to make it in-person interview. WLC accepts five Summer Interns each year. Applications must be received by April 1 for the following summer. Thank you for your interest in Wildlife Learning Center!